Mirabilis plants are half hardy perennials that reach from 60 cm to 1.2 M in height; they are usually grown as half hardy annuals in the garden. 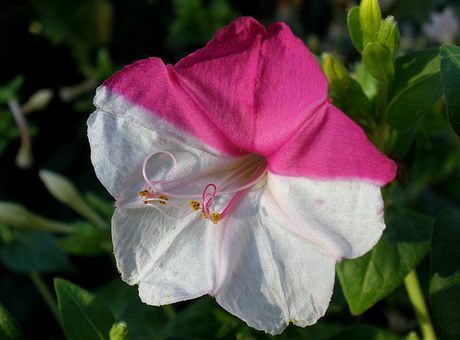 Mirabilis bloom from summer until the end of autumn, but will only grow in warm areas that have low humidity. They carry trumpet shaped flowers of pink, red or white that come out in the evening and have a fragrant nature. 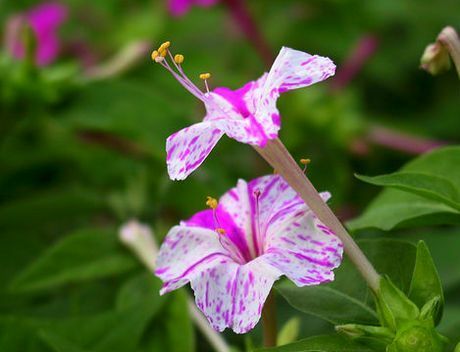 Some common names for Mirabilis include Beauty of the Night, Four-o'clock, Wishbone Bush, and Marvel of Peru. Mirabilis jalapa – Marvel of Peru by Jam343; creative commons. Mirabilis jalapa – Four O'clock flower by Salvatore Ingala. Common Names: Four O'clock flower, Marvel of Peru, Beauty of the Night, Wishbone Bush, Heartleaf Umbrella Wort. Height: 6 to 50 inches (15 to 125 cm). Flower Details: Yellow, red, white, pink; often two-toned. Deep throated trumpets. Fragrant. Flowers open in the evening. Foliage: Green. Thin. Oval or heart-shaped. Sow Outside: Surface. Following last frost or in autumn (warm areas). Spacing 4 to 40 inches (10 to 100 cm). Sow Inside: Use peat pots. Germination time: one to three weeks in the light. Temperature 70°F (21°C). Seven or eight weeks in advance. Transplant outdoors following the last frost or in autumn. Requirements: Full sunlight or light shade. Good drainage. Soil pH 6-7. Ordinary soil. Monthly feed. Regular watering. 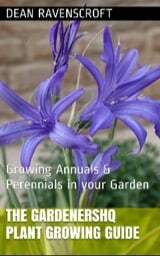 Perennials should be cut back to the ground once flowering has finished. Propagate: dividing in the spring. Miscellaneous: Mirabilis is the Latin word for amazing/wonderful. Beauty of the Night, Four O'clock flower and other Mirabilis Plants should be sown about a week after the last frost of spring on the surface. The plant likes to grow in an average soil that is slightly acidic to neutral (pH 6 to 7). Beauty of the night can be grown both in sunny and in partially shaded areas. If starting Beauty of the night and other Mirabilis off indoors then start about one and a half months in advance. The seeds should be sown in peat pots and takes about one to three weeks to germinate in the light at 20 degrees Centigrade. Once ready transplant the young beauty of the night plants following the last frost at from 15 to 20 cm (small Mirabilis) or 30 to 90 cm (larger species) apart. Once growing it is best to water beauty of the night regularly; it is also necessary to fertilise Mirabilis plants once a month. Once the flowering period has finished cut the plants back to ground level. If you require more Mirabilis plants then the tubers can be divided in the spring.